Signed by Fritz Leiber and Alicia Austin. Hand-crafted, saddle stitched (with thread), covers and all. Frontispiece glued in. 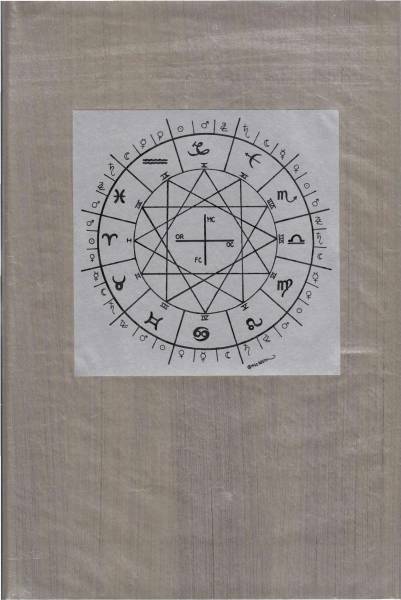 Additional Zodiac symbol used on cover laid in. Wolfe’s afterword, dated Oct. 1982, has caption: Vunce around der momma’s kitchen / py Hans Katzenjammer. “Seventy-five copies were handsewn into covers of Strathmore Rhododendron cover with endpapers of dar blue moriki, a handmade tissue imported from Japan. These books were enclosed in a dustwrapper of Silver Teachest from Japan and slipped into cases handmade by Judi W. Conant of Guildhall, Vermont.” Issued in envelope with title on front and copy number in pencil on back. Contains an afterword by Gene Wolfe.